Rivet Athletics is a new gym in Portland, OR that helps you channel your inner athlete and pursue a better version of yourself. 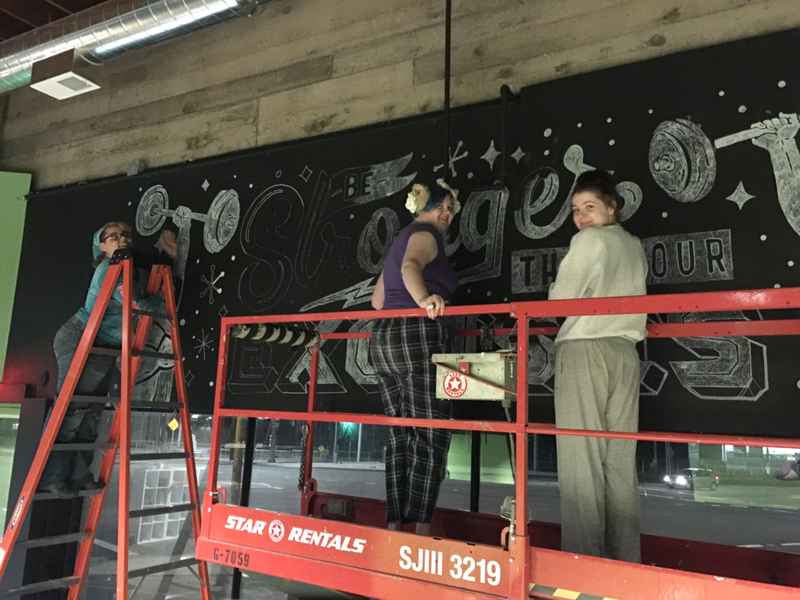 This new business was building their gym from the ground up, and needed a large 25 foot chalk mural to welcome customers as they walked in. When Suzi and Robert first reached out to me they had a ton of ideas and excitement for their project, but didn't have a clear view of their goals. So before we got started on the design, they first hired me to create the art direction and content for their mural. Since this design would be high up along a landscape wall, we decided that a long phrase smack dab in the middle would be the best use of space with some illustrations on either side to help draw in the eye. 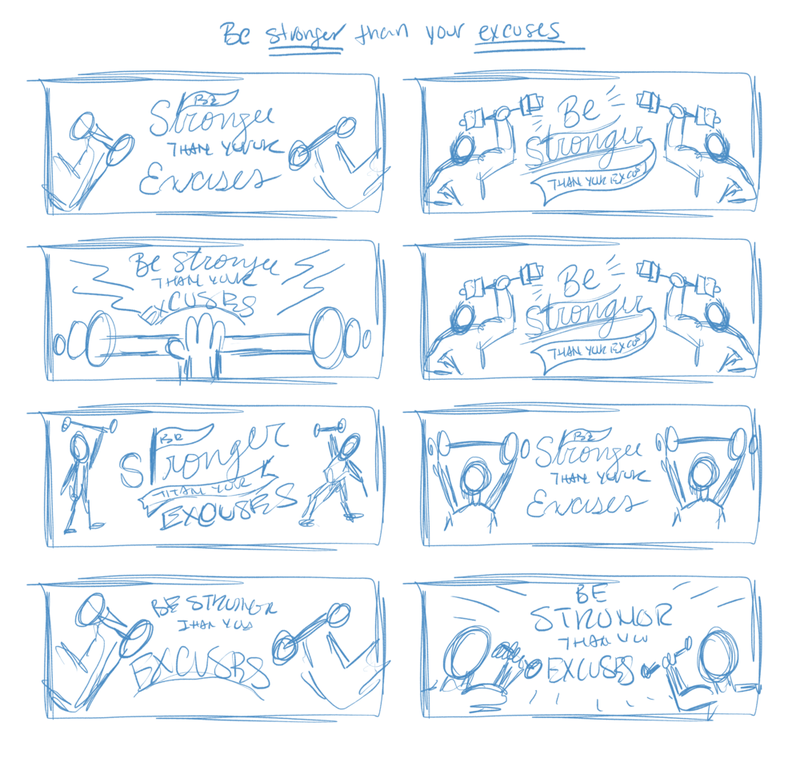 Since this design was so far up, we decided a short phrase like "Be stronger than your excuses" would help keep the lettering legible. They wanted a vintage feel to this design, so I decided to include a classic strongman and strong woman character from the 1920's on either side to match the asthetic of the lettering. Once we had an established art direction, I got to play around with a few rough ideas to get a feeling for kind of composition that would fit best for this piece. We had agreed on the tagline, along with a illustration of a man and women on either side lifting weights, but figuring out how they would lay out took some exploration. To save time, I like to work quickly through the thumbnail process drawing almost childlike doodles and letters. This way I can get as many ideas on paper as possible. I wanted to present two concepts to Suzi and Robert, so I ultimately choose to go with the top two thumbnails you see here. I had an option where it would be focused on just the arms and another that included an illustration of each gym member from the waist up. Working digitally in Photoshop, I illustrated the top ideas I had for their hand lettered chalk mural using my iPad Pro and Apple Pencil. Although both concepts were great, I was happy to hear when they choose the bottom concept to move forward with. With no revisons needed, I could begin to create a high fidelity mock up of this design to take all the guesswork out of the mural installation process. To improve my clients bottom line, I recommended that they purchase commercial rights for this design so they could sell it on shirts, water bottles, mugs, and more. So I created a high resolution file in Photoshop, giving them the availability to use all the assets together or just the lettering on it's own. It took 2 days in 5 hour shifts to install this piece with the help of a handful of my students from my Illustrated Lettering class I teach at PNCA (Pacific Northwest College of Arts). Having assistants to help this project along was a real game changer, making the whole experience quicker and much more fun. With the help of a mechanical lift and ladders, we were albe to use a projector to cast the image on the wall to trace the outline. That way it would save us time, and allow us to not miss a single detail in the illustration. Since they had planned to have more chalk murals in the future (lower to the ground that people could touch), I choose to use liquid chalk markers for a smug free solution. That way all of the murals would look consistent throughout the building. 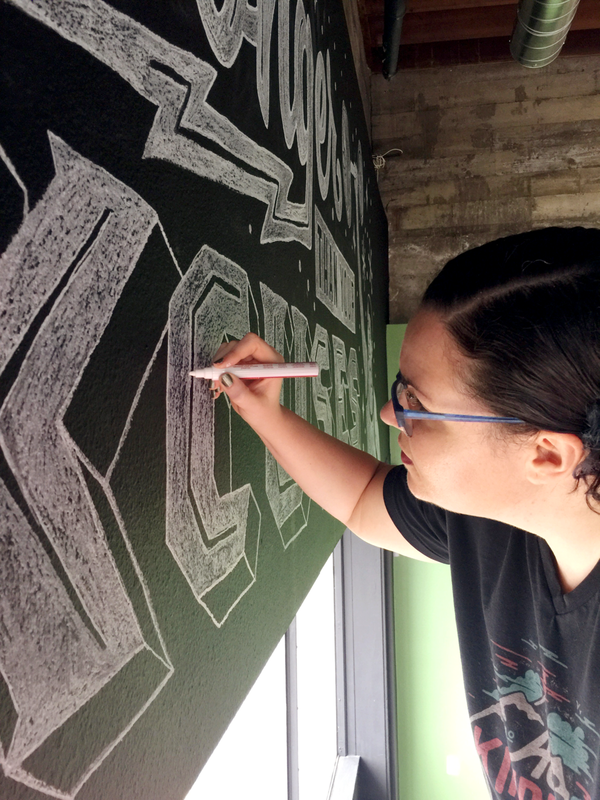 Since the surface of the wall was textured, we had the happy accident of our chalk markers matching the exact feel of regular chalk for a more organic feel.